SSL, a business unit of Maxar Technologies (formerly MacDonald, Dettwiler and Associates Ltd.) (NYSE: MAXR; TSX: MAXR), has announced that the Restore-L mission to provide satellite servicing in LEO has completed an extensive NASA review called the Mission Preliminary Design Review (PDR) and is on track to meet the next development milestone, which is called Key Decision Point C (KDP-C). The on-schedule progress and successful reviews for this mission, which will develop and demonstrate key technologies essential to future NASA missions and commercial activities, are tangible evidence of SSL leadership, experience, and commitment to space innovation. Artistic rendition of the RESTORE-L spacecraft. Image is courtesy of SSL. 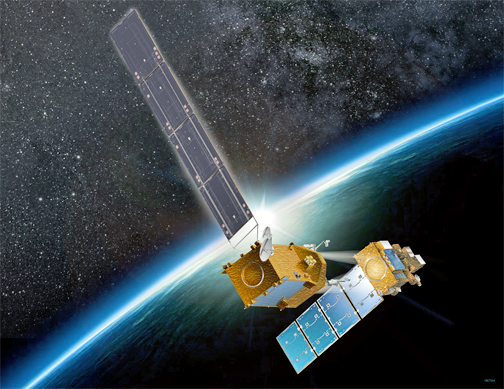 As announced last year, SSL is working with NASA Goddard Space Flight Center’s Satellite Servicing Projects Division (SSPD) to build a spacecraft that will — for the first time in history — refuel a satellite in LEO not designed to be serviced. In addition to demonstrating refueling capability, Restore-L will validate the use of tools, technologies and techniques developed to enable future space exploration missions and satellite servicing in LEO. To meet the requirements for high-performance and reliability, Restore-L’s design is based on the world-class SSL 1300 spacecraft platform, which has the flexibility and power to enable a broad range of missions, including satellite servicing, space exploration and advanced communications. The SSL-built spacecraft bus will provide the structural support, propulsion, attitude control, data and communications interface, and power to support the Restore-L robotic payload for the on-orbit demonstration. NASA missions undergo multiple rigorous technical and programmatic reviews as they proceed through the phases of development prior to launch. With the Mission PDR complete, Restore-L is on track toward KDP-C, which is scheduled to take place in early 2018. This is the third of six major NASA mission milestones, culminating in the final design and fabrication of the spacecraft. NASA is also leveraging SSL’s capabilities and experience to help reduce cost and schedule on a variety of next-generation missions that use groundbreaking commercial technologies. These include a NASA Discovery Mission to explore the asteroid Psyche, and the Dragonfly program to develop robotic satellite assembly on-orbit, which SSL recently demonstrated on the ground. Richard White, the President of SSL Government Systems, said that the satellite servicing technologies that Restore-L will demonstrate are critically important to our nation’s security, commercial development of innovative activities in LEO and fundamental to future NASA missions to cislunar space and Mars. SSL is honored to be leading the charge in the development of dynamic new space architectures, and helping to preserve American leadership in space.